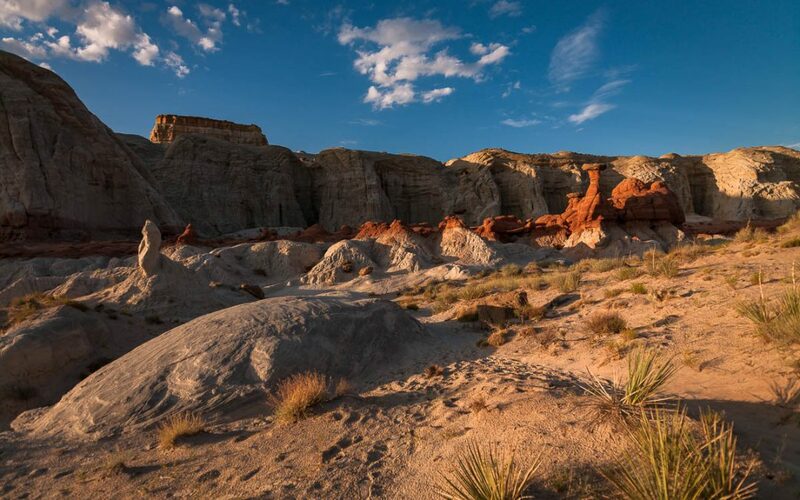 Hoodoos are among the strangest geological formations found on earth. They occur when a thick layer of soft rock is capped by a thin layer of harder rock. As the land erodes, the soft rock washes away faster leaving a thin column protect by a hard rock cap. 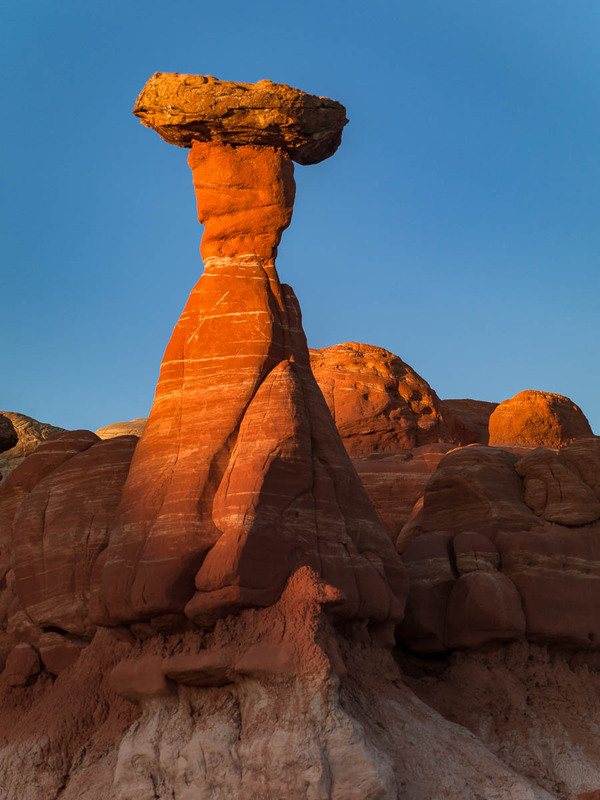 Nowhere are hoodoos more abundant than in southern Utah. Thousands are displayed in Bryce Canyon National Park. 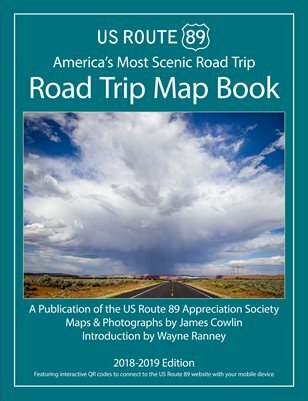 There is also an outstanding collection of hoodoos just north of US Route 89 between Page and Kanab in the Grand Staircase-Escalante National Monument. 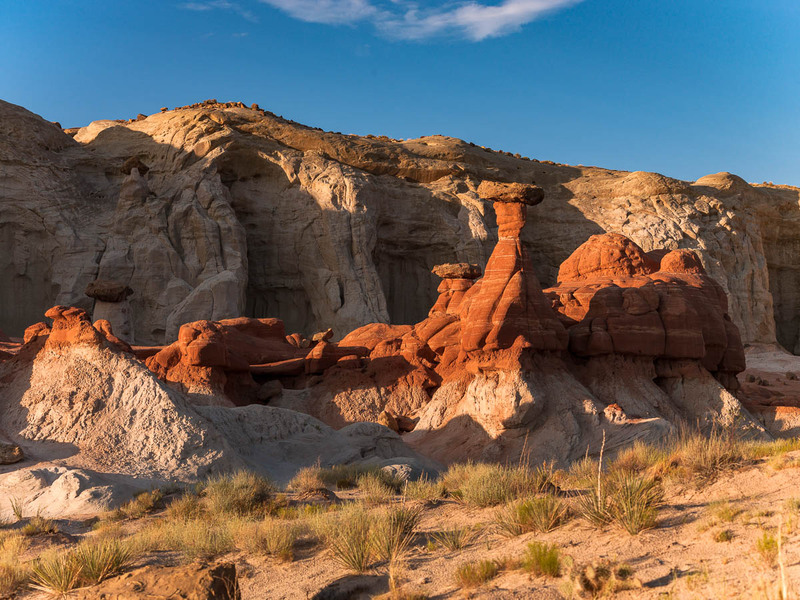 These hoodoos resemble toadstools because of the prominent cap rock resting on thin spires. There is no sign at the trailhead leading to the Rimrock Hoodoos. Watch for a small parking area on the north side of the highway between the southern end of Cottonwood Canyon Road and the Cockscomb fault. 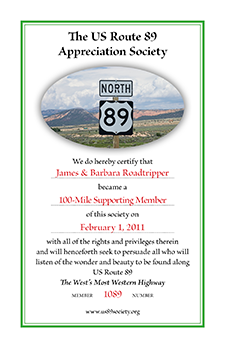 It is about a mile east of the BLM Paria ranger station near milepost 20. Go through the opening in the fence, sign the register and follow the wash north. Watch of rock cairns that mark the best path. The hoodoos are at the end of the trail after a 15 or 20 minute hike. 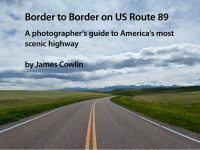 Plan on spending an hour and a half for the round-trip with time to take photographs and enjoy the peace and quiet. 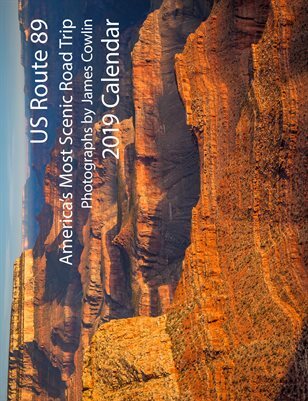 To learn more about visiting the Grand Staircase-Escalante National Monument, go to the Page to Kanab Road Trip Guide.